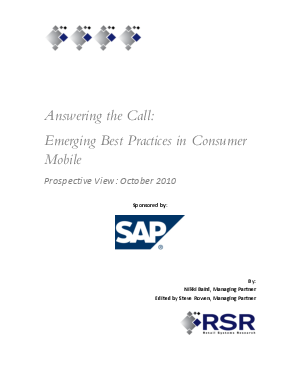 This paper will examine the state of consumer mobile in retail today, Driven in part by RSR's research among retailers as well as a look at the mobile use---cases that retailers have currently deployed. We found that the short list of what retailers need to have in first generation mobile capabilities is actually quite long, spanning deep product information, including ratings and reviews, some kind of scanning capability, full commerce, and more. And the retailers that you would expect to be farther along in deploying mobile capabilities have only just begun to dip their feet in the water, while other retailers who were slow to the ecommerce game are firmly in the lead when it comes to mobile.